I love programs that take place during World War II especially series that take place in England. I hope in my lifetime I never go through what the people of England went through during the war. I don’t ever want to fear being invaded or be scared out of my wits on a nightly basis because I am being bombed by an enemy. 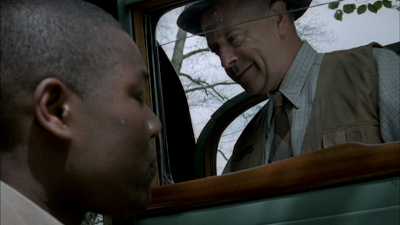 I have seen a lot of series that gives us a good look at what that period of time was like but when you get to a series like Foyle’s War, it gives you that era but puts it into a unique context. The lead in this series is Christopher Foyle. He is not a soldier nor is he in the army. He is a police man. In fact he is Detective Chief Superintendent for the town of Hastings which is on the coast. This is pivotal to the overall story because Hastings is an ideal spot if the Nazis would ever invade England. 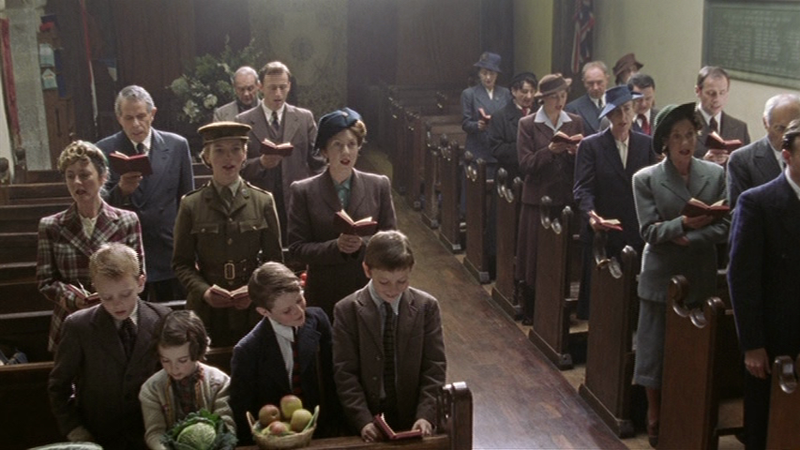 In reality, the story of Foyle’s War is, in some ways, the story of England during the Second World War. 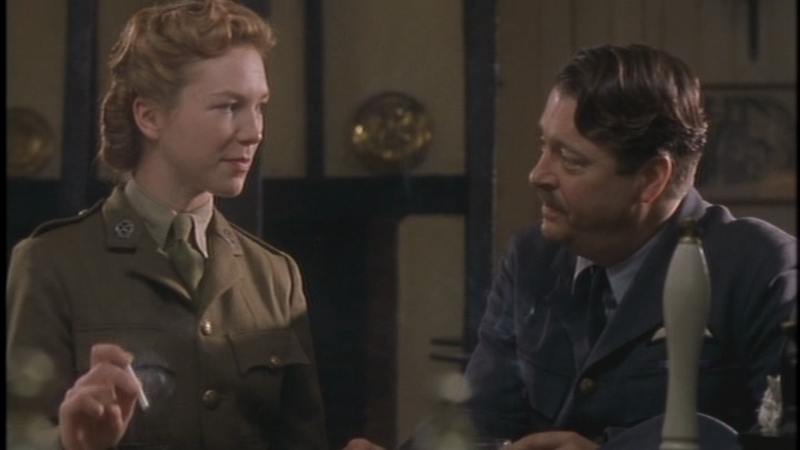 It’s more than just the series main characters but the overall feel to the period of time.The series has a lot to do with military procedures and battles but this Foyle’s War also is focused on crime during this era. 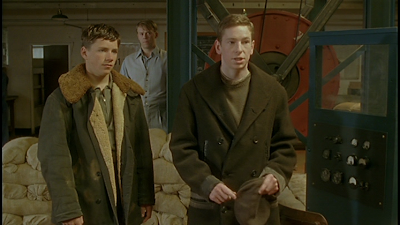 It focuses on the people in the UK who either tried to take advantage of the war or tried to escape the war and it is up to the people like Foyle whose job is to stop it. 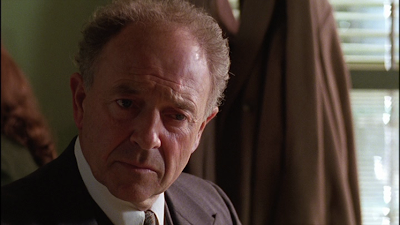 Christopher Foyle is played wonderfully by Michael Kitchen. I wrote about Michael Kitchen before when I went through the series To Play the King. He was perfect in that but is absolutely amazing in this. Foyle is an interesting person. 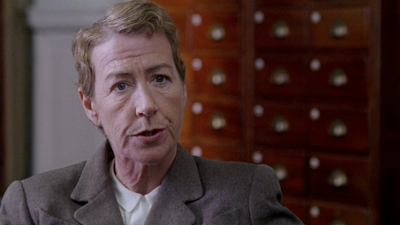 In the first episode, The German Woman, our first sight of Foyle is in his Superior’s office wanting to be transferred out the police. Foyle believes he would better serve his country if he were allowed a different role that would work directly with the war effort. His Superior believes the opposite; Foyle is a good police officer and Hastings needs someone like that now. Foyle has been at his job for a long time. It is clear that he thinks with years of experience on his side. He is much underrated in his approach to everything. He is not one of those detectives who gets angry or intimidates; he demands respect and to be honest so does this series. Apart from Christopher Foyle there are a couple of other regular characters in this series. Sgt Milner joins with Foyle in the first episode. Foyle is short staffed in the office and needs someone to help him. 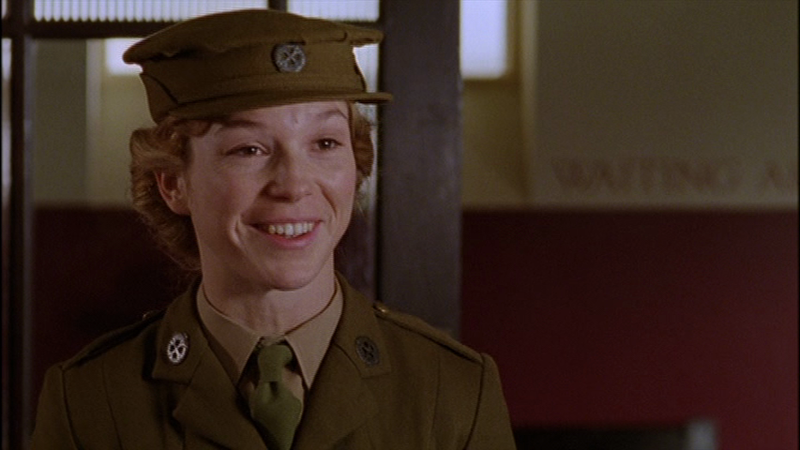 In the first episode, Milner is back from the war. He just lost his leg in Trondheim and is trying to pick up the pieces again. Foyle respects Milner and wants to add him to his team. Foyle also gets a driver named Sam. That actually is Samantha Stewart. 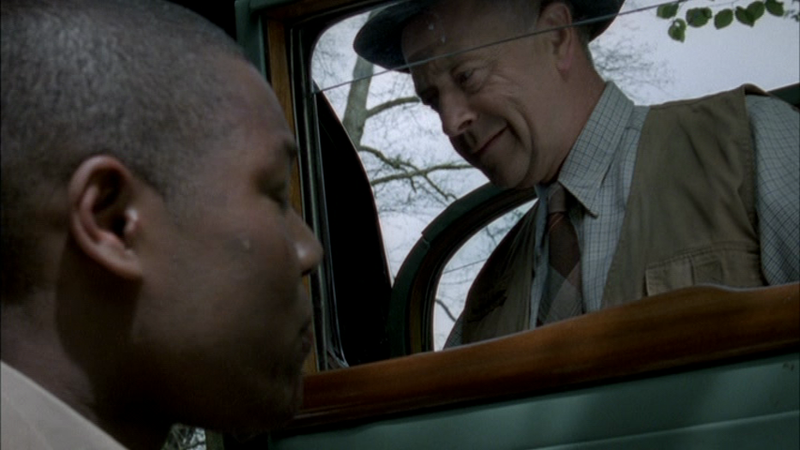 As stated in the first episode Foyle does not drive. Sam is transferred to from the Mechanised Transport Corps to become Foyle’s driver. Foyle and Sam create a sort of an almost father/daughter relationship except Foyle never interferes with her life but if he is unhappy about something, she just instinctively knows. 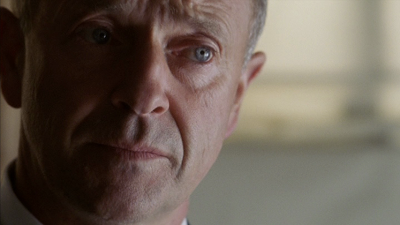 In fact, Foyle says more with his subtle facial expressions that with words. Foyle’s son Andrew was a pilot with the RAF. He is in and out of the series depending on where the war takes him. At one point, he even starts seeing Sam. Foyle is a widower. He wife has passed away a long time ago. 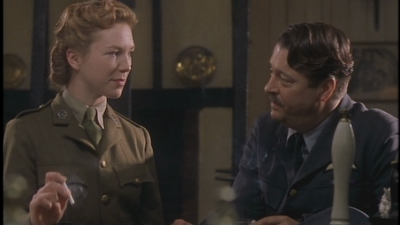 Brigadier Wilson: What do you want Foyle? Foyle (calmly): Well, we could start with your resignation. This boxset includes all 22 episodes from the very first one to the end Series 7. This gets us ready for Series 8 when it debuts over here this year which is really exciting. To look at each episode in this box would be overwhelming so I thought I could break it down better by year. The year is a big part of the overall story. Most epsiodes are tied to a certain event in World War II. I like how it really shows us the ups and downs for the British population during the war seen through the eyes of Foyle, his sergeant Milner and driver Sam Stewart. The first series shows us England that is already at war. This takes place shortly after the German invasion of Norway. It is interesting to see how the British public reacts harshly to anyone who is German. 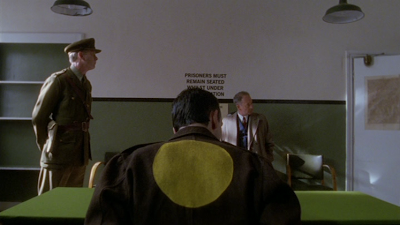 In the episode The White Feather, we see that there are groups and associations in England that show support for Germany and believe that the British Government is the one on the wrong side. Meanwhile the threat of a German invasion looms everywhere. It feels like most people feel like an invasion will succeed. A lot of what Foyle needs to do is interview people who are in the military or who have lost loved ones in the war. What makes this work, especially as Foyle is not a soldier in this war, is that his son Andrew is in the war and eventually joins the RAF. This is a perfect plot device that allows Foyle to better sympathize with people who are directly affected by the war because of family ties just like Foyle. In the episodes, people and military personal are much more interested in speaking with Foyle once he mentions that his son is in service. Series 1 is 4 episodes and includes such guest appearance from Robert Hardy, Bernard Kay, Sophia Myles, and David Tennant. I fell in love with Foyle’s War with this series. Many people in England at this time were sure they were going to be invaded by the Nazis. This included people who were in higher ranks. This series was where I started to literally rejoice in the fact that television like this was being made! All four episodes from this series are great. Stand outs for me include Fifty Ships where Foyle starts to find out that sometimes the war effort is greater than justice which is something Foyle vehemently despises. War Games is a great episode where Foyle gets a firsthand look at some of the very secret things going on to try and win the war. We also start to see how families get torn apart due to patriotism and see the brutality that can come from it especially if family members are from Germany. There are a lot of pure human aspects to this series. Series 2 is 4 episodes with guest appearances by Clive Merrison, David Troughton, Christopher Benjamin, and Emily Blunt. As the war goes on Foyle finally has a chance to be transferred to Naval Command in Hastings but how is this tied to a death of the son of Sir Giles Messinger who is an important naval officer? Sometimes Foyle loses to be able to win. In Enemy Fire, We see how experimental treatments are done to military personal that are badly burned while in combat. Throughout the series we also get a glimpse at how awful generally human nature can be even during something as horrible as World War II. In the last two series, we see how the public puts their trust in people such as fire brigades etc. who will rob them or in some cases blackmail them. World War II, for some people, was a story of profiteering. Series 3 is 4 episode and guest stars include: Ronald Pickup, Angela Thorne, Samuel West, Bill Paterson, and Peter Capaldi. In the Invasion, the Americans join into the war and start taking up residence in Hastings. They need to turn beautiful countryside into an airfield which does not go down so well with locals. Alcohol is not found anywhere but a local pub is making their own to a very deadly degree. In Bleak Midwinter, Sgt Milner is suspected of murder of someone very close to him while in Casualties of War, Foyle realizes that the Hastings he fights so hard to keep lawful is undermined by his superiors. This will eventually lead him to a difficult decision. Guest stars include Philip Jackson, Roy Marsden, Keith Barron, Liz Fraser, John Nettleton, and Michael Jayston. Series 6 was originally meant to be the end of the series. The series was cancelled by ITV and work was put in motion to end the series. It takes place from April 1944 to May 1945. The mood of England is one of knowing the Germans are running out of resources and that everyone is close to the end of the war. This doesn’t mean everyone is excited. There is a lot of uncertainty for our 3 main characters as the next chapter in their lives begins. Nothing will be the same again. Once again, this series reflects what was happening in England at the time these episodes take place. It’s not all about the main cast. In fact, I would say that is one of the best parts of the series is that it is balanced really well. One subject that gets tackled in a couple of episodes is how returning soldiers re-integrate themselves back into their normal lives with their families. Some husbands hadn’t seen their wives or children in years. The children may have no idea who their dads are because they were too young when they went off to war. By the end of the final episode All Clear, everything has changed for everyone. Guest stars include Michael Jayston, Clifford Rose, and Graham Crowden. Series 7 is the most recent broadcast on TV in the states from 2010. The series takes place between June and August 1945. It features three episodes and I feel, if one could dare say it, is the least impressive of the entire series but not for the reasons I would have thought. If I were a betting man, I would have said the reason why I found Series 7 the least interesting was because World War II is over. Nothing could be further from the truth. There is plenty going on in England with the restoration effort and what to do with all the prisoners of wars and Russian soldiers? Those plots are still extremely stimulating and the visual effects of war-torn London when Foyle visits in The Russian House are great. In fact, The Russian House was the first episode I had ever seen of this series and I loved it. For me, the problem was more with the main characters. By the end of the series, the three of them are off doing their own things. It disjoints the episodes by having to find a story that keeps these now very separate people together. In Series 1-6, they all worked together and because of that the stories were more contained. With the characters living different lives, the story telling needs to change. It’s not that I hate it but I find it more difficult to believe. I am hoping Series 8 rectifies this to some degree. That being said, I would still rather watch that than most other television. The series tells us a very unique story about the Second World War in England. It diverts from actually a story of fighting on the front lines to surviving in the homeland while trying to maintain the structure of authority and to some extent normality. There are great moments in episodes like Enemy Fire and Invasion where the old traditions and customs are threatened and perhaps destroyed to keep the war effort going. In Fifty Ships, The Funk Hole, and War of Nerves features citizens who become profiteers by selling or stealing and taking advantage of people’s fear during the war. We know about rationing during the war but Foyle’s War presents different aspects of living in the UK during the war to try and protect their country. Such as, some citizens who lived in Germany were not allowed to own cameras for fear of sensitive pictures getting back to Germany. 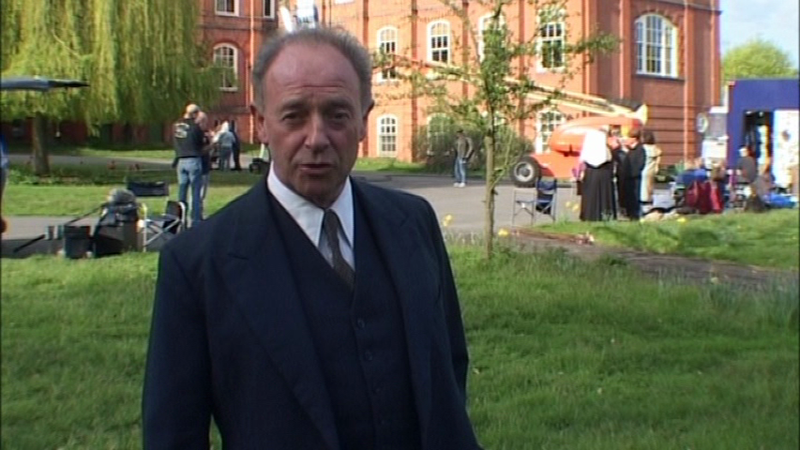 The Making of Foyle’s War: (23:49) This documentary is narrated by Nick Gardner and focuses on the making of Enemy Fire especially the sequence of one of the Spitfires exploding at night. It’s a really nicely done “making of” feature. The Making of Foyle’s War: (6:54) This isn’t a long documentary but it is a nice little look inside the making of the series. Narrated by Anthony Howell (Sgt. Milner) this has a look at the making of Casualties of War. It’s short but has some decent information on it. This is found on Set 4 Disc 3, The Invasion disc. The Making of Foyle’s War: This is another short making of once again narrated by Anthony Howell. I found this more interesting. This is the making of Plan of Attack (which is an excellent episode). This making of focuses less on the making of the episode but more on how historically accurate it is. The episode is about a group of soldiers and engineers who are recreating maps of German cities to aid in the bombing of key facilities. At the time this episode was made, the information that this group existed wasn’t even known until a few years earlier. Once again short but well worth a watch. This brings up an interesting point. Anyone who is a Doctor Who fans knows that for 6 years there was a program made called Doctor Who Confidential that took us behind the scenes of how episodes were made. I think it would be much cooler to have a series called Foyle’s War Confidential that could be mini-documentaries focusing on historical authenticities of the episodes we just watched. The only low point of the above extras is that there is really no involvement from Michael Kitchen yet I have read he doesn’t like to do interviews. There’s not much they can do about that! 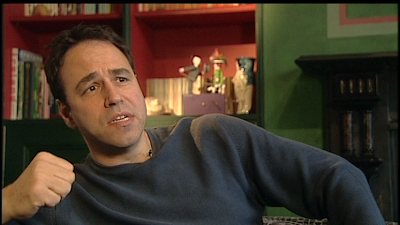 A Conversation with Anthony Horowitz #1: (11:23) This is an interview with the creator of Foyle’s War Anthony Horowitz. It is nice listening to him because I get the feeling he really enjoys this character and series. I loved listening to him and the conversation ranges to why Foyle’s War was created to how Michael Kitchen got involved. There is also a great story about how Anthony Horowitz came up with the name Christopher Foyle. A Conversation with Anthony Horowitz #2: (12:10) The second part of the interview with the creator of Foyle’s War focusing on the research of the series. We also hear Anthony talk about writing about the main characters for the series. The two interview segments are really nice. A Conversation with Anthony Howell and Honeysuckle Weeks: (13:43) It’s an interesting interview where I think this is a case of actors don’t really like to be interviewed. Howell’s and Weeks answers are very good but they don’t really look like they don’t want to be there yet I am glad this interview is on the set. They have interesting things to say even if they look a little bored! Each disc also contains a piece called “The Truth about” and whatever episode you are watching. It is a few text screens that you read that explains how what we saw in the episode was real or based on historical fact. They are nice to have but I am not always a fan of reading many pages of text on my TV. Too bad these couldn’t be contained in a small booklet but I understand that this would be probably way too expensive to do. There are other text screens that have interviews with the stars and creator and writer Anthony Horowitz. The quality of these episodes is fine. They were made in 16:9. Based on some research it looks like Series 1 -6 were shoton 16mm film with Series 3 -6 post-produced on videotape. From Series 7 onwards it becomes an HD production. Series 7 is not available on Blu Ray. Theoretically, if all the film still exists from these series, all of Foyle’s War could get a true HD upgrade someday. The picture on these sets is fine just like any modern day production. A did notice a few film specs occasionally which was a little surprising to me and it feels like some of the earlier episodes like The White Feather is bright with no contrast. This is a 22 disc set that is housed in 6 standard sized Amary cases. It’s compact with each set that had been released housed in one Amary case. Depending on which set you choose to watch there are 3 to 4 discs in each case. I think the covers and look of this packaging is simple and has some character to it. It fits well with overall look of the series. 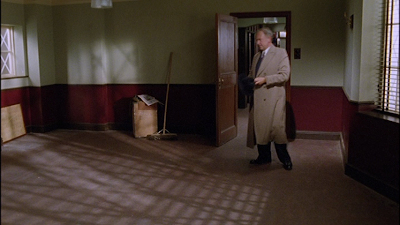 Each case or disc cover has a picture of Foyle and in the background some other character. Overall it is a really nice and heavy package. I feel like it is completely worth the money and will not take up a ton of room on the shelf. If you are like me, there is very little shelf space left! Disc 1: The German Woman, A Conversation with Anthony Horowitz, Production Notes, Cast Filmographies. Disc 2: The White Feather, Production Notes, Cast Filmographies. Disc 3: A Lesson in Murder, Production Notes, Cast Filmographies. Disc 4: Eagle Day, A Conversation with Anthony Horowitz, Production Notes, Cast Filmographies. Disc 5: Fifty Ships, A Conversation with Anthony Howeel and Honeysuckle Weeks, Foyle’s War Production Notes, Fifty Ships Production Notes, Behind the Scenes Photo Gallery, Cast Filmographies. Disc 6: Among the Few, Production Notes, Cast Filmographies. Disc 7: War Games, Production Notes, Cast Filmographies. Disc 8: The Funk Hole, Production Notes, Cast Filmographies. Disc 9: The French Drop, The Making of Foyle’s War, Production Notes; The Truth Behind The French Drop, Cast Reflections, Cast Filmographies. Disc 10: Enemy Fire, Production Notes; The Truth Behind Enemy Fire, Cast Reflections, Cast Filmographies. Disc 11: They Fought in the Fields, Production Notes; The Truth Behind They Fought in the Fields, Cast Reflections, Cast Filmographies. Disc 12: A War of Nerves, Production Notes – Fascinating Facts; The Truth Behind A War of Nerves, Cast Reflections, Cast Filmographies. Disc 13: Invasion, The Making of Foyle’s War, Creator/Writer Anthony Horowitz on Foyle’s War, The Truth Behind Invasion, Cast Filmographies. Disc 14: Bad Blood, Cast Filmographies. Disc 15: Bleak Midwinter, The Truth Behind Bleak Midwinter, Cast Filmographies. Disc 16: Causalities of War, The Truth Behind Casualties of War, Cast Filmographies. Disc 17: Plan of Attack, Cast Filmographies. Disc 18: Broken Souls, Cast Filmographies. Disc 19: All Clear, The Making of Foyle’s War, Honeysuckle Weeks on the end of Foyle’s War, Anthony Howell on the end of Foyle’s War, A Real Life Foyle, Cast Filmographies. It’s hard to encapsulate this entire series into a few short pages. 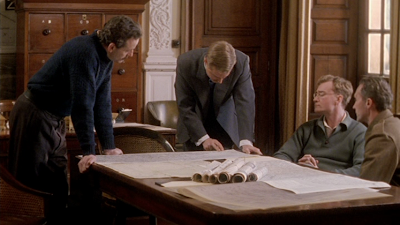 What make Foyle’s War great are the stories, settings, historical details and Michael Kitchen. If you know anyone else who has seen this series, they will tell you the same things. This is a compact inexpensive way to watch the entire series before the new episodes become available. 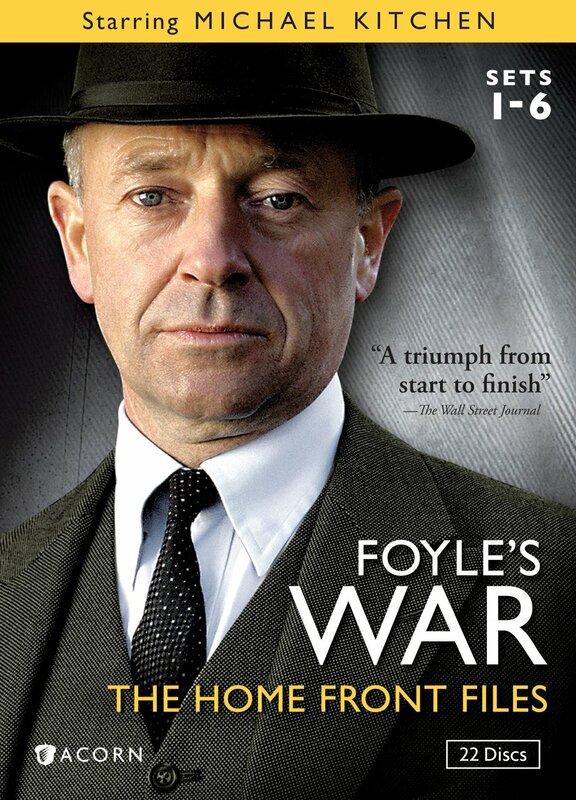 World War II may be over but that’s not the only war Foyle will be involved with in this series. This series is highly recommended. Check it out! Next review: There is a massive backlog of material that I am writing reviews for which will be up in the next couple of weeks. This includes Ripper Street Series 1 Blu Ray, Alice in Wonderland and Alice Through the Looking Glass from BBC Home Entertainment and No Job for a Lady and Midsomer Murders: Tom Barnaby’s Last Cases from Acorn Media. Lots of lovely stuff! Very nice, comprehensive review of a truly wonderful series, Greg! This looks like an amazing set, and the price is good for 22 discs. I completely agree, Michael Kitchen is amazing in this, and I love his interactions with Honeysuckle Weeks (what a name! ), who makes Sam a really fresh and cheerful character. Excited for the series 8, which debuted today in the U.K. Thanks for the kind words about the review. Though I am annoyed I didn't even mention how awesome the music is from Jim Parker! I am looking very forward to Series 8 but will probably wait until it shows up over here on PBS. Can anyone tell me how to use or find closed captioning for the early seasons of FW? how to get CC or whether it is definitely not available until season 6. I understand season 6 has subtitles which is not quite the same thing as CC but adequate. dialects and especially local slang expressions.